Schnitzelburg Area Community Council: General Meeting - One Week from Today! General Meeting - One Week from Today! 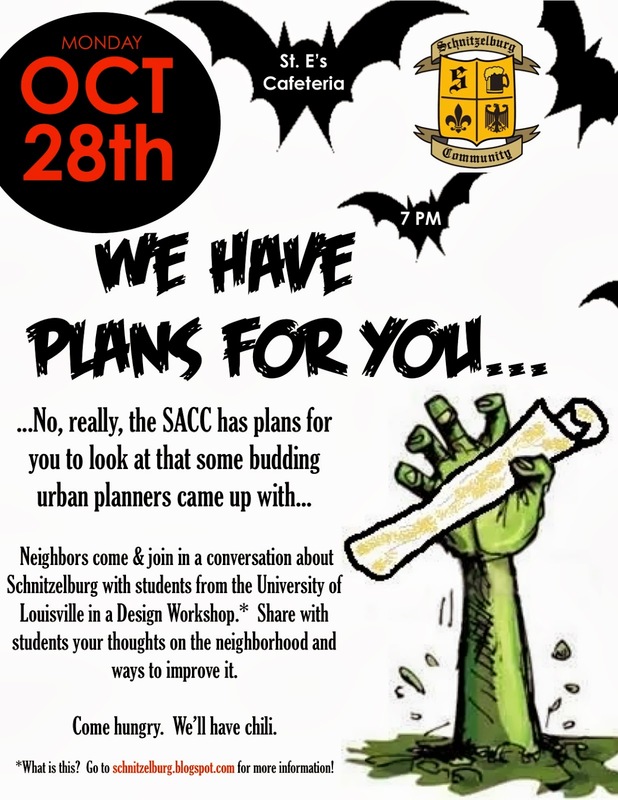 The Schnitzelburg neighborhood in the City of Louisville has been selected as the subject neighborhood for the Fall 2013 Neighborhood Planning Studio course, an elective course in the Master of Urban Planning in the University of Louisville’s School of Urban and Public Affairs. Schnitzelburg was selected because it presents a diversity of urban issues the students will be able to explore within the 3-month semester. In addition, there is an engaged citizenry in the neighborhood, particularly from the leadership of the Schnitzelburg Community Council. The president, Mike Morris, has many years of experience in neighborhood leadership and revitalization and provides an important resource for the students. 1. Establish Goss, Burnett, and Hickory as vibrant, mixed-use corridors. 2. Explore means to where individuals and families could have the option to limit auto-use. 3. Protect and enhance neighborhood’s walkability. 4. Seek opportunities to create a complete “age in place” neighborhood to reinforce the neighborhood’s multi-generational character and history. 5. Develop opportunities for public spaces. 6. Leverage success of neighborhood events (Dainty, Walks, etc.) to define sense of place in the neighborhood. The students will be focusing on several key elements for the plan, including land use, economic development, urban design, and mobility. Following the student’s initial neighborhood scan and further discussions with neighborhood leaders, other elements could be considered. We look forward to seeing you on Monday night. You are a part of this neighborhood and you have the chance to make positive change! Your opinions matters - large or small!! So, get out your smart phone and put in a reminder, make a brightly colored note on your calendar, and tell all your friends (a great chance to invite your next door neighbor)!